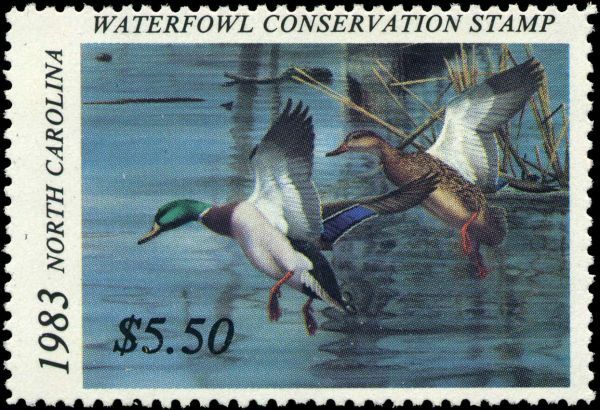 The winning artwork will be featured on the 2019-2020 waterfowl conservation stamp, also known as the North Carolina duck stamp. Artists 18 years and older are eligible to enter the competition. Entries, along with a $50 entry fee, must be submitted by 5 p.m. on Jan. 18, 2019 to the Washington Tourism Development Authority, located at 108 Gladden Street, Washington, N.C. 27889. The Commission and the Washington Tourism Development Authority sponsor the annual national contest, which typically draws artists from across the United States. This year, artists may submit a full-color, realistic rendering of tundra swans, blue-winged teal, ring-necked duck, lesser scaup, or bufflehead, which must be depicted in the appropriate habitat. Artists may submit only one design, in whatever medium they choose. Images must be horizontal, 13 inches by 18 inches, matted in white to outside dimensions of 18 inches by 23 inches and should be loosely covered with a protective overleaf, although not framed or covered with glass. The image should bear no signature or other marks that would identify the artist. A panel of five judges, who have expertise in waterfowl biology or artistic method and expression, will select the winning artwork on Jan. 29, 2019. The winner will receive $7,000 in prize money. Proceeds from sales of the print and stamp support the Wildlife Resources Commission’s Waterfowl Fund, which generates revenue for the conservation of waterfowl habitat in North Carolina. For more information on waterfowl hunting and licenses in North Carolina, visit ncwildlife.org/hunting.